We teach Spanish as a foreign language, whether group intensive or semi-intensive courses, private or semi-private classes, Learn on the go (learn while travelling), classes on Skype, and a wide array of cultural and recreational activities. We are proud to announce that Agora Language Center has been approved as exam center for the SIELE exam. SIELEstands forServicio Internacional de Evaluación de la Lengua Española. It is a new exam designed by Instituto Cervantes (IC), the University of Salamanca (USAL), the University of Buenos Aires (UBA) and the Universidad Nacional Autónoma de México (UNAM), all of them renowned institutions. This exam is for all those who want or need to have an official documentas a proof of their level of Spanish, whether it is to be used for Immigration, a job application, admission to a university or just for personal purposes. The SIELE exams consider the variety of the Spanish language (Spain, Argentina, Mexico). The exam consistsof 4 tests: readingcomprehension, listening comprehension,written expression and interaction and, last, oral expression and interaction. The levels are those established by the CEFR (Common European Framework of References for languages), A1, A2, B1, B2, C1. The exam is digital (from the registration, the exam itself, the results and the certificate). It is flexible, as the candidates can choose to test their global competence in Spanish or some specific ones (oral or written) and also because they can choose the date and ocation of their exam. The results are given 3 weeks after the exam. It is not a pass or fail exam, all candidates receive an evaluation stating their level as A1, A2, B1, B2 or C1. There are five exam options: the global exam or 4 independent modalities. The global exam includes RC, LC, WIE, OEI in this order, it lasts 3 hours. Within three weeks, you can find out your results and download a certificate or report, depending on the mode chosen. Upon completing the SIELE Global exam, you receive a globally recognized certificate, valid for two years, including per-test scores and a CEFR level equivalence and a numerical score representing the sum of each test. Upon completing a SIELE INDEPENDENT TEST, you receive a report validi for two years, including your test score(s) and their corresponding CEFR level equivalence. Detailed descriptions of each test can be found on www.siele.org as well as a demo exam. We recommend to attend a preparation course to become familiar with the different parts of the exam and how to deal withthem. These courses are not mandatory but they are very useful in order to come better prepared the day of the exam. We are getting ready andwe will publish course and exam dates very soon. We invite you to check www.siele.org for complete information on the exams and, if you have further questions, do not hesitate to contact us. Forget about the Boston, New York or Chicago marathons! Mexico has its very own Maraton Guadalupe Reyes….. If you have Mexican friends, you must have heard these two words. Guadalupe Reyes refers to the period from December 12th (day of the Virgin of Guadalupe and beginning of the Christmas season) to January 6th (Day of the Three Kings or Día de Reyes and end of the Christmas season). The Posadas (December 16th to 24th),) iChristmas, New Year´s Eve and Día de Reyes make up a marathon of celebrations, but an eating, drinking and partying marathon rather than an athletic one…….. The posadas (spanish for shelters) are originally meant to recreate the trip Joseph and Mary had to do during 9 days to find shelter in Bethleem. Traditionally, every day of the posada period, families and neighbors gather in a different house to represent Joseph and Mary asking for shelter. People holding candles stand outside a house and sing a song asking for shelter. Those inside first refuse to let them in until they finally offer shelter. Once inside, they are offered food and drink. The posadas can also be a party with coworkers, friends, relatives, and in spite of their religious origin, they are usually a good excuse for drinking…..
January 6th is the end of the “marathon”, children get presents from the “Reyes Magos” and everybody eats the “Rosca de Reyes” (a special sweet bread with candied fruit and a figurine of the baby inside). Whoever gets a piece with the baby inside is supposed to host a “tamales” party on February 2nd (Día de la Candelaria or Candlemas day). The larger roscas usually have several babies inside so the responsibility (and cost) of buying the tamales can be shared. Guadalupe Reyes is over today, time to remember your new year´s resolutions. Why not learn Spanish in Mexico to find out more about its rich culture, in addition to the language! Summer is over for lots of people, who are now back to work or to school. But for us – lucky residents of the Riviera Maya – there is a lot to look forward during these coming months…. September is “el mes patrio”, with the celebration of Mexico´s National Day on the night of September 15th, the traditional ceremony of “El Grito”, fireworks, fair, food, party….. and September 16th is a holiday. In September we can enjoy the “chiles en nogada”, a special version of the chile relleno, with a different stuffing (pork meat, raisins, almonds and spices). The chiles are covered with pomegranate (only found at this time of year in Mexico) and the combination of green (chiles), white (cream) and red (pomegranate) makes this dish the emblematic one for las fiestas patrias. Some restaurants also offer a vegetarian version…. From the end of August, bakeries and supermarkets start selling the traditional “pan de muerto” (supposed to be served for the Day of the Dead, on November 1st and 2nd). Not everybody starts buying it in September, but it´s a reminder that this celebration is coming soon…… All stores are also full of Halloween related items. Halloween is not a Mexican tradition, but it is becoming increasingly popular among children, and the Riviera Maya has a very cosmopolitan population, with many people celebrating Halloween. The Day of the Dead is among the most important and interesting celebrations in Mexico, with some regions particularly renowned for their celebrations (Janitzio in Michoacán, Mixquic, DF) among many others. Yucatan has its own way of celebrating the “Hanal Pixan” (food of souls) and for people in the Riviera Maya who cannot attend these celebrations, Xcaret hosts a beautiful “Festival de vida y muerte” (festival of life and death), a great way to get to know about this Mexican tradition. Every year, the festival has a special guest, this year it will be Mayan communities and, for the first time, a Latinamerican country. And then, right after celebrating the Day of the Dead, it´s time to get ready for Christmas….. The Christmas decorations can be seen at the windows from the end of November, as well as the natural Christmas trees that are on sale from mid November!!! It´s not all about celebrations, though…… Since summer is usually so hot here, we look forward to cooler days and even to our “cold” winter with minimum temperatures of 15 degrees Celsius at night. September to November are low season months for tourism, not the best for a tourist-based economy, but it´s nice to enjoy less crowded beaches and special offers and discounts in local businesses. Winter months are also windy, something kitesurfers look forward to. Lots of good reasons to plan a trip to Playa del Carmen this fall, to learn Spanish or improve your skills and be part of our traditions! We left Playa early to visit Ek Balam, a beautiful Mayan site in Yucatan, not far from Chichen Itzá, but less visited, with a more intimate atmosphere . After climbing the 105 stairs of the highest pyramid, part of the largest complex, the Acropolis, you have a wonderful view of Yucatan, 360 degrees of green, dense forest, and unbroken horizons, definitely worth climbing! The Acropolis is both a temple and a palace. About half way up, stop to admire some ornate carvings that decorate the exterior part of a king´s tomb. Large stone teeth create the impression of a massive jaguar’s mouth protecting the tomb. The site is surrounded by two walls which served to defend the site against attack, and had a meaning of military strength. After Ek Balam, we decided to cool down in a cenote. The area is full of cenotes, so it´s hard to choose. We followed a local guy´s advice, who showed us the way to Zac Wa. After walking a long path in the forest, we reached the cenote. We climbed down a wooden staircase and landed on a small island surrounded by clear blue waters with lots of small catfish swimming around. Vines and trees strech down from the ground above. We got to talk to the local lifeguard who explained that this cenote is connected to another one only 100 meters away, but only accessible to divers. As he was going home for lunch when we left, he walked along with us and showed us different plants and explained their medicinal use. We even stopped at another huge cenote, not accessible to tourists (not yet!) for lack of a staircase to climb down. By then, everybody was starving, so we drove to nearby Valladolid to have lunch and take a quick tour of this colonial city. 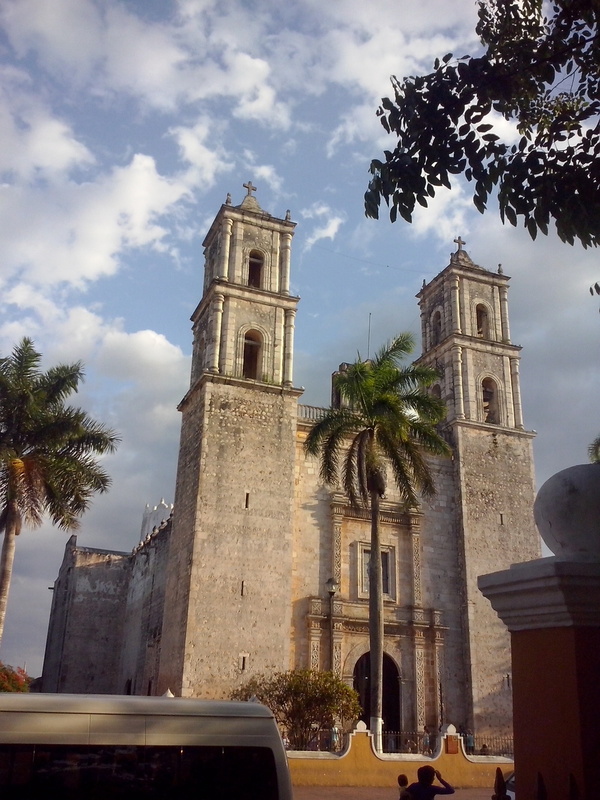 Valladolid is now a stop on most tours to Chichen itzá, so the tourist related businesses are thriving. On weekends the main square is full of local vendors of handicrafts, hats, shoes, local embroidered blouses and all sorts of Mexican goodies, marquesitas, churros, ice creams! The church on the main plaza is only one of the many churches to admire in this beautiful city. Why learn Spanish in Playa del Carmen? Mandarin chinese is by far the most spoken language in the world, while Spanish comes next with over 400 million native speakers, 25% of them in Mexico, a good reason to choose Mexico to study Spanish. In Mexico, Playa del Carmen is the best option to combine study and vacation. You can be on the beach just a few minutes after you finish your classes. Everything is within walking distance and you can get everywhere (school, beach, cafés, supermarkets, gyms, etc) without a need for buses or taxis. You can also do some sightseeing in the afternoons after class. The Mayan site of Tulum, for example, is only one hour south of Playa. There are many options for weekends, whether archaeological sites, cenotes, beaches, islands, colonial cities, mayan villages, not to mention a few unique experiences such as swimming with whalesharks (fMay to September), scuba diving, kitesurfing, paddleboarding, among others. Playa has something for everybody. All year long, we have cultural and artistic events, such as the jazz festival, carnival, the festival of life and death, the Riviera Maya film festival, the Guelaguetza festival and much more…. always something going on…. Come study Spanish at Agora Language Center and let us share all that with you! Enjoy a professional language course in a friendly and safe environment! Study Spanish and vacation at the same time! Contact us by email: agoralanguagecenter@com or on Facebook: Agora Language Center and let us help you organize everything! Sunday 7th, 8:30, some students and staff are off to Cobá!....... After an easy 100 km drive, we arrive at Cobá…. 10 am, it´s already quite hot so we decide to rent bicycles. The site is huge and a bike makes the visit much more enjoyable. obá is different from the other major sites in Yucatan. There are 4 lakes in the area, something uncommon in Yucatan. Cobá means "Waters stirred by wind". The site is not as excavated nor reconstructed as Tulum or Chichen itzá. Coba still has big structures covered by jungle. It is much less visited than Chichen Itza or Tulum and the first visitors in the morning can have the site for themselves. Coba dates from the Classic Period, 600 to 900 AD, when it was abandoned. At its height it had a population of around 50,000. Once an important trading post and a commercial link between the cities on the coast and those inland, it remained covered by jungle until the 1890s. We also stopped by two ball courts. Those at Cobá are much smaller than the one at Chichen Itzá. The game was played between two teams, using only their hips and elbows to get a rubber ball through a stone ring. Human sacrifice was part of the game, although there are different theories as to who actually was sacrificed - the winners or the losers? After over two hours on the site, we return our bicycles and decide to go on to our next stop, Punta Laguna. Only 20 km from Cobá, Punta Laguna is home to the Reserve of Spider monkey, set in the Mayan jungle, It surrounds the lagoon of the same name, the main water source for the inhabitants and the wildlife. The local Mayan community was hosting a musical event organized by Dreams for Mayan Children, a non profit organization (www.dreamsformayanchildren.org) Chak, a great local artist played for the community and the visitors and explained the situation of the community, threatened by a development that would exclude them. The community children sang for us and the women welcomed us with water and handmade tortillas. After the concert we took a short walk to the beautiful lagoon where it is possible to swim, kayak and walk in the jungle to watch the spider monkeys. The rain interrupted our plans, but we decided that we would go back to visit the reserve and bring some school supplies to the children in the village. These children need to be able to grow up in their community and get proper education within their own culture. Akumal comes from the Mayan word aak=turtle, so it means place of turtles. Mexico has the largest number of sea turtles species in the world. Akumal is only 35 kilometers south of Playa (20 miles), and you can get there in 40 minutes by “colectivo” (round trip only around 5 usd). Once you get off the van, a short walk will take you to the beach. You can either join a snorkeling tour (around 25 usd to rent the snorkeling gear, life vest, and follow the guide into the water) or try to find the turtles on your own…… you can be very lucky and spot one after a few minutes or it may take a bit longer (a group of snorkelers in the water most likely means turtles are there!). Once you find a turtle, it´s fun to watch her. Turtles frequently have to swim up to the surface for air, and you can just follow them, without coming too close or touching them. The ocean floor is covered with sea grass, the turtles´ favorite food, just watch them as they graze. The extra effort of looking for the turtles instead of just letting your guide do that is highly rewarding. Once you find them, you will just want to swim alongside these beautiful and peaceful creatures and you will probably end up spending two hours in the water, before finally getting out feeling relaxed and content! 11 AM.... A bit more crowded, still beautiful!!!!!!!! LAER DEG SPANSK I MEXIKO! I Playa del Carmen kan du kombinere studie og ferie! Kurs begynner 15 Juni, 6 Juli og 20 Juli. Lær deg Spansk og opplev Mexico! Why start a blog about learning Spanish by a post on whale sharks? Because if you´re thinking of taking a Spanish course in Mexico, remember that from May to September, you can swim with whale sharks very close to Playa del Carmen. There are only about 10 locations in the world where this is possible and the warm waters of Mexico´s Quintana Roo state draw more whale sharks than any other place in the world. Whale sharks are the size of a whale but they are fish, they are both the largest shark and the largest fish (40 to 50 feet long). Born quite small (just about one foot long), whale sharks can give birth to around 300 pups at a time. In spite of the huge, impressive size they reach, they are totally harmless….. they only eat plancton and fish…. The only danger would be to get hit by their tail, but all necessary precautions are taken during the tours to avoid such incidents. Whale sharks are so representative of our area that they are on all Quintana Roo license plates. Not only is this a unique experience not to be missed if you are in the area at this time of the year, it is really a good reason to choose to learn Spanish in Playa del Carmen from May to September so you don´t miss that! At Agora Language Center we can help you organize this tour and combine it with a great weekend on Holbox island.